In England children are entitled to free schooling. However, more and more schools are asking parents to make a contribution or pay outright for the mobile devices that their children use in school. This is one of the criticism I have heard of BYOD and BYOT. However, I think this is based on a misconception of the actual position. Traditionally schools pay for all of the technology for use in school. This includes the network infrastructure and the computers and other devices. The funding might actually come from a grant or sponsorship, but parents are not asked to pay towards the cost of digital technology in the school. Many parents are of course buying digital technology for use at home, which is not allowed to be used in school. 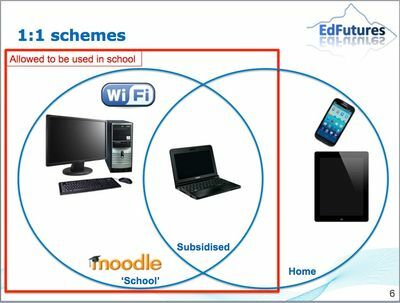 As schools move to 1:1 computing models they often ask parents to make a (voluntary) financial contribution towards the cost of mobile devices (e.g. laptops, netbooks, tablets). These payments often take the form of a monthly payment over two or three years. The school pays for the infrastructure (e.g. wireless network) and fixed technology (e.g. specialist desktop machines) and also pays for mobile devices for those pupils whose parents are unable or unwilling to pay the voluntary contributions. This in effect increases the overall spend on digital technology for use in schools - it includes the school expenditure plus parental contributions - but it perhaps sits a little uncomfortably with the notion of 'free schooling'. Parents may also continue to buy other digital technology for use at home (e.g. mobile phones, games consoles). 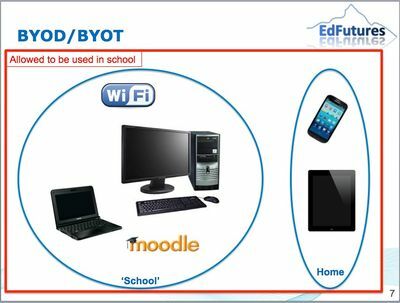 BYOD recognises that many pupils already have access to Internet enabled mobile devices that could be used in school. The school still has to provide the infrastructure (e.g wireless network), specialist equipment (e.g. powerful desktop machines, scanners), and provide mobile devices for those pupils who do not have their own. I would argue that this approach is more acceptable than the Subsidised approach because it does not require additional expenditure by parents - it simply allows the use of the equipment that they have already bought. Before you move to a Subsidised (1:1) or Parents pay (BYOD/BYOT) model you need to know what mobile devices your pupils already have access to at home. I know of one school that wanted to move to a 1:1 iPad model and discovered that 10% of their pupils already owned an iPad. That represented a considerable saving in terms of the number of devices that needed to be bought. YOTS is a free service to schools to help them audit the Internet enabled mobile devices that their pupils have access to, and find out whether their pupils would be allowed, able and willing to bring those devices in to school on a regular basis. Armed with these data schools can make informed decisions about their digital technology strategies. In the UK, Local Authority schools who are interested in leveraging value out of parental expenditure on digital technology ought to check out how they can help parents buy mobile devices without having to pay VAT - a potential win win for the school, the parents and the pupils. This page was last modified on 26 November 2013, at 04:03. This page has been accessed 9,463 times.